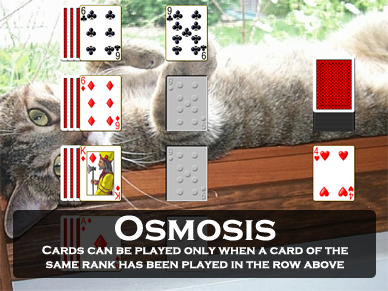 Click on the screen shot of the game Osmosis from Pretty Good Solitaire to download the 30 day free trial version. Osmosis, sometimes also known as Treasure Trove, is an interesting and different solitaire game. Unlike most solitaire games, you do not build the foundation piles up in the usual way (such as up by suit). My version of Osmosis in Pretty Good Solitaire allows you to play offline, full screen, with complete undo and my unique right click quick move. It's the best way to play solitaire! In Osmosis, 16 cards are dealt 4 cards each to 4 reserve piles, with only the top card face up. This top card is available for play. Then one card is dealt out to the first foundation pile. The remainder of the cards form a stock, which will be turned over 1 card at a time to a waste pile. The first card dealt to that first foundation pile is what starts the game. The other 3 foundation piles begin empty. On the first foundation pile, you can play any other available card of the same suit. So, for example, if the King of Hearts is the card played to the first foundation pile, you can play any other Heart to that pile. On the next foundation pile, you can start the pile by playing any card of the same rank (value) as the first card played to the first pile. So in the example, you could start the next pile with any other King. After the first card has been played to a pile, you can then play any other card of that suit that is of a rank that has already been played to the pile above. Suppose in the example you are able to play the King of Clubs to the 2nd foundation pile. With the King of Hearts starting the first pile and the King of Clubs the 2nd, you can now play any Heart to the first pile, and then any Club of the same rank to the 2nd pile. So if you then play the 6 of Hearts to the first pile, you could then play the 6 of Clubs to the 2nd pile if it is available. The process filters down through 4 foundation piles, one for each suit. Eventually the goal is to get all of the cards into the 4 piles. When you have no moves, you can turn over the top card of the stock to a waste pile. There are unlimited redeals. When the stock is empty, you just turn over the waste pile and run through it again. The key to winning is to get the face down cards out of the 4 reserve piles. Since all of the cards in the stock will eventually become available, the only way to lose is to not be able to get a card out of the reserve. 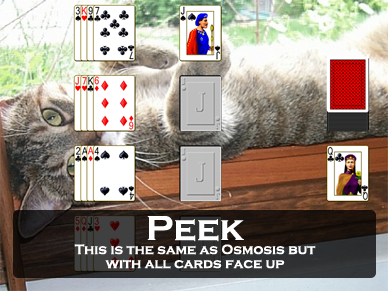 The game Peek is a variation of Osmosis. 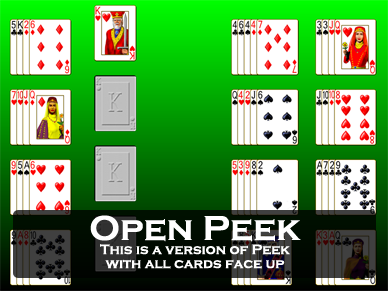 The only difference between Peek and Osmosis is that in Peek you can see all the cards in the reserve (none of the cards are face down). Therefore in Peek you know where all the cards are buried.